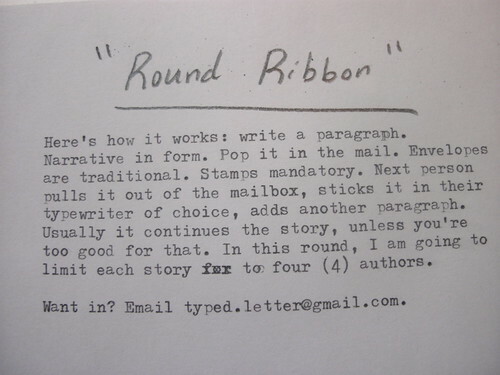 What do literary stalwarts of the original typewriter era make of all this? “We old typists, it makes us feel young again to think there’s a new generation catching on,” said Gay Talese, 79. He still uses a typewriter, albeit electric, as does his friend, Robert A. Caro, 75, the Pulitzer-winning biographer of Robert Moses and President Lyndon B. Johnson. They discussed Mr. Caro’s Smith Corona while watching the Super Bowl. 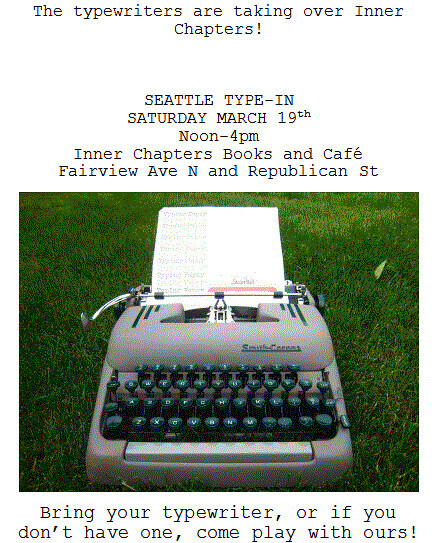 If you're going to be in the Tacoma, Washington area on May 1, grab a typewriter and stop by the main branch of the public library. Another type-in is in the works. Does anyone else feel like that blogroll is making you want to post more often? I'm certainly feeling the (friendly) pressure to keep my own blog updated. I'm seeing a boost in traffic, too (Blogger keeps stats, if you're into that sort of thing, which I am.) Rob at Typewriter Heaven just crossed a pageview milestone, and I bet you're all getting at least a little rise in numbers from Typosphere.net, even if it's just everyone else checking out your site. I have no problem with mutual admiration societies. Comments? Questions? Want to be added as a contributor to this blog (meaning you can post here.) What can the Typosphere do for you today? If I already have your address, you can just leave a comment here. Do you type? Do you blog? Do you dabble in that weird offspring known as typecasting? Then you, too, are part of the Typosphere. There are a number of personal blogs and sites out there dedicated to typewriters and their uses in the twenty-first century, and we'd like to hear from you.